If you are reading this, it is probably because you would like to know what it takes to buy and use commercial fireworks in a future display. The process to legally obtain and use these fireworks is actually rather straightforward. Have an ATF license to purchase commercial fireworks. Pick up the fireworks just before you use them, or have storage meeting the ATF regulations for the fireworks. Any fireworks that are left over from a display either need to be used, destroyed, or returned to storage. And although not a specific regulatory requirement, you need to get training to keep yourself and your audience safe. This document is an overview of how to apply for an ATF license, what to expect during the approval process, and what to do once you have your license. Fill out the web form with your contact information. Check the box in front of "Fingerprint Cards". This will open up a drop down box, and be sure to select the "FBI FD-258EX - Explosives Applications" version of the fingerprint card. Click on the "preview" button. Check that the information is correct, and then click on the "Submit" button. Once your fingerprint card arrives in the mail, you will need to contact your local police department. I suggest that you call them on a non-emergency number and ask if they will complete the fingerprint card. Often they have limited staff and hours or might not do it at all. They may do this for free, but a few departments charge a fee. Now that your fingerprint card is on the way, you need to obtain a 2" by 2" photo. A passport photo will do, and these can be obtained from many drug store chains such as CVS, Walgreens, or office supply stores, and even an AAA travel office. You can also take and print your own photo, but make sure that it is of high quality and meets passport quality standards. Visit https://travel.state.gov/content/passports/en/passports/photos.html for more details. Here is an Example Application already completed. 5a. Enter the address where you will store your records. This could be your house, apartment, or place of business if you are a business owner. This is also going to be where the ATF will plan to show up when they want to inspect your records, which they will do at least once every three years. This does not have to be the location where you will use or store your fireworks. 5b. Enter your mailing address if different than the address entered in 5a. Leave blank if they are the same. This usually does not apply, but if the "premises location" does not have an address, then give them directions and/or a map to figure out how to get to the premises location. Enter phone number that you wish to give to ATF. They are going to want at least one number to get in touch with you. 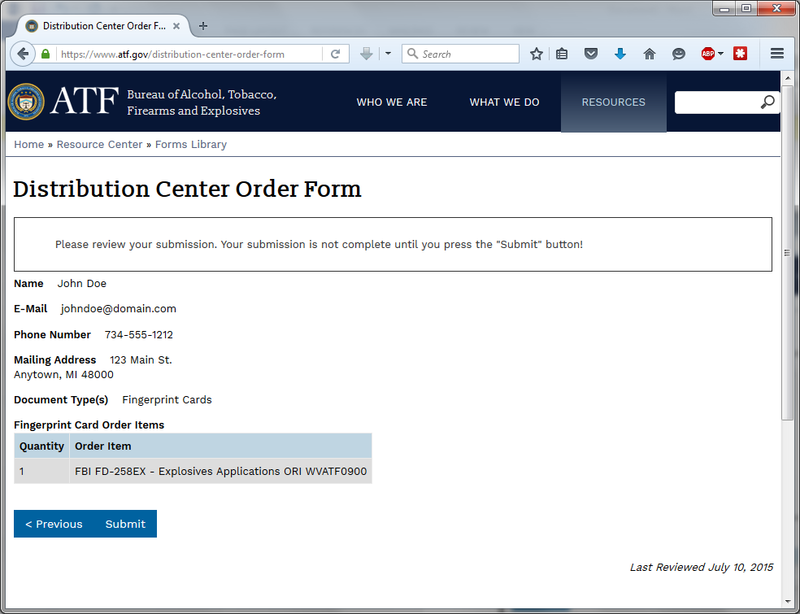 Email is optional, however, it may help the ATF to get in touch with you. I am not aware of any contact other than someone from the ATF needing to get in touch with you regarding your application and/or inspections from this address. Check the box next to the method of payment. If you use a credit card, then fill out the rest of the info below and make sure to sign the authorization allowing them to charge your card. Enter your contact information as a responsible person. Under "user of explosives" check the box in front of "fireworks". Please, do not be tempted by the limited user or limited permit. These licenses require a bunch of extra paperwork to use, limit where you can purchase, how many times you can purchase, and when they expire, you can't use them while you wait for your renewal to be processed. Make sure to select "user of explosives". Answer all of these questions. If you have to answer "yes" to any of these questions, getting your ATF license may still be possible, but might require additional effort and will likely take considerably longer. You are required to have at least a few "hours of operation" listed on the application. The reason for this is during your hours of operation the ATF may show up for a surprise inspection and you are required to take the time to work with them and provide them with access to your records. If you are closed, then even if they show up and you greet them, you have the right to ask them to return during your hours of operation, or make an appointment at another mutually agreeable time. You are not required to actually be around or be "open" during the hours listed. But you are required to enter something. As a hobbyist, you will likely find a note on the door from the ATF stating that they stopped by, and please call them to schedule an appointment for an inspection about 2 to 3 years after you receive your ATF license, although they can show up at any time, or more often. Enter "yes" as at some point you might want to shoot fireworks in another state. Enter "yes" as at some point you might want to buy fireworks from our PA location (if you live in Michigan or from our Michigan location if you live in PA). Check "yes" for 22a and enter "0" for 22b. Sign the application, enter "owner" or whatever other title you want to give yourself, and enter the date that you signed the application. The next sheet is the "Explosives Storage Magazine Description Worksheet". Under item J, check "contingency plan" (If you are going to have a magazine, see Note below.) Under owner, if you are closer to our Saline, Michigan location, enter "ACE Pyro, LLC" and under Address and phone number, enter "13001 E. Austin Rd, Manchester, MI 48158, 734-428-0900". If you are closer to our Clearfield, Pennsylvania location, please enter "Fire Art, LLC" and under Address and phone number, enter "13065 Old Erie Pike Rd, Clearfield, PA 16830, 814-765-5918". At the bottom of the form, enter your name (typed is ok, does not need to be signed), and enter the date. Leave the rest of this entire form blank. Then you will need to send us a request for a letter of contingency storage. Please make sure to include your full name, mailing address, and phone number and we will reply with a letter that you will include with your application. If you are located closer to our Saline, Michigan office, send the request to info@acepyro.com. If you are closer to our Clearfield, PA office, send your request to info@fireartcorp.com. NOTE: If you are going to have a magazine, you may want to consider first getting your license using contingency storage and then once you have the license adding the magazine. I have known of cases where a person has had their license held up for a very long time while trying to resolve an issue relating to their magazine, where they could have had the license and used contingent storage while they brought their magazine into compliance. Attach your 2"x2" photo to the application. Review and make sure that you filled out all of the information as suggested above. Make sure that you sign the application. Payment (include either a check or credit card info on the application). A few weeks after you send your application to the ATF you will get a call from an Industry Operations Investigator (IOI) that is local to your area to setup a time to meet with you. The meeting will most likely be during normal business hours during the week as the ATF usually does not work evenings or weekends for normal inspections. During the phone call, they may ask a few background questions about your application, however, mostly they will just setup an appointment to meet you at your licensed premises location. When you get together they are going to ask a variety of questions. What they are trying to determine is that you will follow the ATF rules. This is straight forward as long as you plan to pick up your fireworks the day you want to use them, you never leave fireworks unattended, and if any fireworks are leftover that you cannot shoot, you will return them to us so we can place them in a magazine. The interview is usually rather simple and informative. Getting an ATF license is a "shall issue" process. So in other words, unless the ATF IOI has a specific reason to deny the license, they are obligated to give you the license. The reasons that they can deny an application are many, but the most common ones are that you are legally not allowed to have a license (you answered yes to one or more of the questions in section 14 or 15 of the application), the IOI feels that you are not able to comply with ATF rules, such as fireworks storage being too far away or you don't have a contingency plan, etc. But, there are very few reasons why they would deny a license as long as you have a good plan on how to buy and use fireworks legally. Once the interview is completed, the IOI has to do a bunch of paperwork and complete a final report regarding your application. Once this is complete, the ATF will either issue a license or send a letter to you stating why they are unable to issue the license. But in almost every case, unless you know of a reason why you might not qualify for a license, you will get your license. Again, it is a "shall issue" license as long as you meet some very basic requirements. From start to finish, this entire process takes about 3 to 5 months. So if you think that you might want to buy fireworks for the 4th of July, get started on this process no later than January. If you have any questions or need any help, please feel free to call our office so that we can help you get your ATF license. When you can legally purchase bigger and better fireworks any time you would like, you will be happy that you did! I received my license, now what??? Once you receive your license make copies of your ATF license WITHOUT your signature. Only sign the copies, not the original. For the purpose of proof of license, a copy of the license that has an original signature is equivalent to the original license. Keep the original license unsigned and in a safe place. Make additional copies and sign them as needed. After you sign a copy, send it to us by email, or by mail. We need this on file before we can deliver ATF regulated items. Our mailing address is ACE Pyro, PO Box 2, Manchester, MI 48158 or Fire Art, PO Box 1041, Clearfield, PA 16830. There is also a requirement to "post" a copy of the license at the licenses premises, however, I rarely ever heard of the ATF checking to see if the license is posted at the location of someone that is not operating a commercial explosives business. So that you are fully prepared for when the ATF returns for an inspection, you need to keep three basic records up to date at all times. This is a record of each regulated purchase. 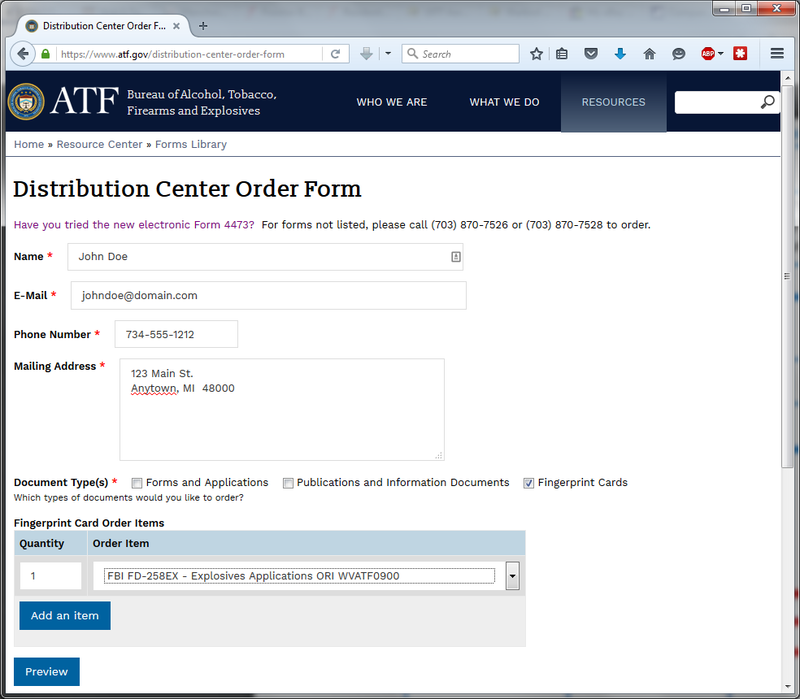 To obtain your acquisition record, just log into your account (www.acepyro.com/Account/Login or www.fireartcorp.com/Account/Login ), click on "My Account" and under your "Order History" select "View Disposition Record" for the desired order and download a copy. Our disposition record meets all of the requirements of your acquisition record. All you need to do is keep a copy. And if for some reason you misplace your copy, you can log into your account any time and get it again. This is a basic report showing your magazine's inventory. Like a bank statement, the DSMT will show when you add items, remove items and how many items remain in your magazine. This is a record of every time you use (or sell) any of your regulated items. If you have contingent storage and pick up your items the day that you shoot them, then this record keeping requirement is extremely simple. Since you are shooting the fireworks the day you get them, you don't have to keep a DSMT, as you are not storing any fireworks. And, you can use the downloaded copy of our disposition record as both your Acquisition Record and your Disposition Record, as it shows all of the regulated fireworks that you've purchased and used that day. If you have your own magazine, download a copy of our disposition record to use as your Acquisition Record and add these items to your DSMT. When you take items out of your magazine to shoot, simple log them as being removed on your DSMT and that will cover your Record of Disposition. Once every three years, and within one year of the expiration date of your license, the ATF is required by their internal policies to inspect all ATF explosives license holders. When they inspect, they will want to meet with you just like your initial interview. This time, they are going to try to determine a few basic facts to make sure you have complied with their rules. First, they are going to look to see that you have all of your records and that they are all up to date. During the process and often after an inspection, they will contact ACE Pyro and/or Fire Art and ask for copies of all of your purchases. We are required to provide these records upon request by the ATF in order to keep our ATF license in good standing. If you are missing records, it is likely that the ATF will figure this out. But remember, we keep a copy of all of your orders and you can access them any time online. So you are able to double check and know for sure that you have all of your acquisition records from us. Next, they are going to look for storage violations. If you are using contingent storage they are going to look to see if you are picking up your fireworks a day or more from the date that you used them. Again, they will use the records that they requested from ACE Pyro or Fire Art to make sure that the dates agree. We will give them a copy of our disposition record, which is exactly the same record you can download on our website. This includes the date that you picked up your order, so as long as you pick up your order the same day as you used them, the ATF will be satisfied that you are following the storage rules. If you have your own magazine, then they will do a full inventory of all of the items you have in your magazine. They will compare this to your DSMT to make sure that your records agree with what you actually have. They will also compare your DSMT to the record of acquisition, and make sure that everything that you purchased was properly recorded in the DSMT. The other major question that the ATF is trying to answer is: Does there appear to be any diversion? Diversion is when a person that has an ATF license gives or transfers regulated explosives to a person that cannot legally have them. This criminal act is how most fireworks find their way onto the black market, and the ATF is always on the lookout for this. Never, ever, allow a person to gain access to or take any of the fireworks that you have purchased, because if they do, you (and they) could become a prohibited person, and never again be able to be near the fireworks that you worked so hard to legally enjoy. Just tell them to get their own ATF license, which you should now be an expert in helping them to get. Ultimately, getting and keeping an ATF license is not a difficult thing for most people to do. The benefits of having your own license far outweighs the small amount of time it takes to get and keep your license. If you have any questions, please feel free to contact us so that we can help you to safely and legally enjoy celebrating life with fireworks!